Create hexagon projects in less time with this unique quilt-as-you-go technique that lets you create a hexagon block with backing and batting included. A great Scrap your Stash technique for using fabric precuts. Mary Hogan is a former university professor who teaches and designs at The Quilting Season in Saline, MI. She focuses on teaching, improvisation and using as many fabrics as possible when creating her string quilts. 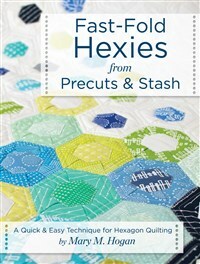 She is the author of Landauer Publishing's String Quilt Style and Fast-Fold Hexies from Pre-cuts & Stash.